News this past week that SeaWorld gives its orcas anti-anxiety drugs (even a nursing orca, against vet recommendations) is another reminder that the captive experience for killer whales is not a benign one. Valium is just one drug, familiar to the public, that SeaWorld uses to address the mental and health issues of its captive orcas. Tagamet, a treatment for ulcers and intestinal issues, is also a supplement for certain whales, according to a number of former SeaWorld trainers. The unlikely image of an unhappy Shamu popping Valium naturally generates buzz. But according to former SeaWorld trainer John Hargrove, the underlying, and profoundly important issue is the boredom and stress killer whales experience in marine park pools. Hargrove has always helped me understand the details and nuances of SeaWorld's orca entertainment business, and is preparing to testify at an April 8 hearing on the California bill to ban orca entertainment. So he has been thinking long and hard about all the issues related to captive killer whale welfare. Hargrove knows firsthand how confinement affects the mental and physical well-being of the killer whales, and he also knows that drugs can't really solve the problem. Killer whales exhibit that boredom in a number of ways, some of which we are familiar with, like chewing on the pool surfaces (a favorite of Morgan at Loro Parque) and lying almost motionless on the surface, known as "logging." But Hargrove detailed some others, which are perhaps less well known. The first: Regurgitation of food. "Many of the whales threw up constantly, which is a byproduct of their boredom," he says. "As soon as we would break from them after feeding they would flip upside down or roll sideways, and puke up all the food. Then play with it, eat it, and puke it up again." Over the course of his career, Hargrove worked at Seaworld California (1995-2001), Marineland in Antibes, France (2001-2002), and SeaWorld Texas (1993-1995, and 2008-2012). When he worked at SeaWorld California, only one killer whale, Splash (who died in 2005), was a chronic regurgitator. "But in Texas all the whales regurgitated. In France all the whales regurgitated. And I heard that the whales in Florida regurgitated," Hargrove says. "I've seen it as a problem with the vast majority of whales I worked with in captivity. Even whales that were holdouts would eventually learn from another whale." Regurgitation may sound like benign (if gross) amusement for a bored killer whale. But it can create serious health issues, according to Hargrove, who also confirms the use of Tagamet on the orcas. He explains that chronic regurgitation not only reduces the amount of nutrition the killer whales get (so they lose weight, and their base food amount needs to be increased), but the physical process and the digestive acids involved damage the esophagus and further erode the teeth (beyond the erosion from chewing on the pools or gates). "The vets would say that the nature of regurgitation is that it damages everything coming back up," Hargrove says. The problem was serious enough, and widespread enough, in SeaWorld's parks that in the years before Hargrove left SeaWorld, there was a high-level effort to convene a team of trainers to try and develop training and other protocols that could be used to reduce or eliminate the regurgitation problem. Hargrove was part of that discussion, but he says that there was never any real follow-through. "The furthest we got at SeaWorld was acknowledgement that regurgitation was a serious health issue and we needed to find a way to fix it." In any case, Hargrove adds, trying to stop the killer whales from throwing up and playing with their food was not easy, in part because it was a behavior that the killer whales taught to one another. While in France, Hargrove says, they even tried mixing spiny mackerel into the food to make regurgitation painful, and therefore less appealing. But the killer whales got pretty good at figuring out how much mackerel was in their food, when they ingested it, and when it was safe to regurgitate. Interestingly, whatever SeaWorld might say to the public about the stimulation given to its killer whales, there was never any question within SeaWorld that regurgitation was a consequence of killer whale boredom. "Everyone saw it as a matter of boredom. It was never seen as anything other than boredom," Hargrove says. "One talked about solution was to actively stay after the last handful of food and keep the animal engaged and entertained to give the food more chance to get down. But as soon as the whales would realize the session was over they would roll over and regurgitate." There is no truth to the charge made by animal rights activists that killer whales at SeaWorld are routinely given medicine like Tagamet. This is one of the many misleading claims made by groups like PETA to advance an extremist agenda. SeaWorld veterinarians prescribe medication for animals only as their condition warrants. Veterinary treatment is part of SeaWorld's comprehensive health and wellness program for the animals in its care and all treatment aligns with clinical best practice. Animals at SeaWorld also benefit from a program of training and enrichment to provide mental stimulation and a continually changing environment. There is no higher priority than the health and well-being of our animals. SeaWorld does try to keep its killer whales healthy and stimulated (though within certain budgetary limits). The issue is whether they succeed. 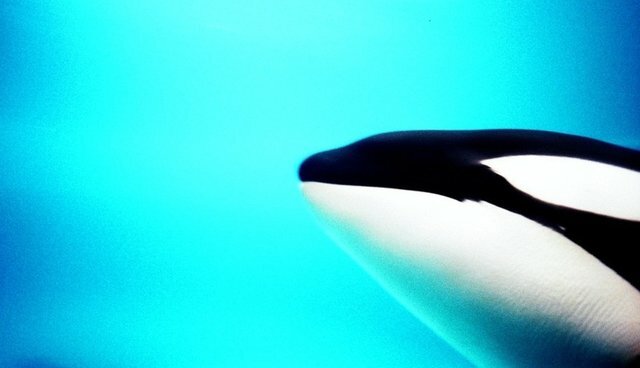 Beyond regurgitation, Hargrove says, the stress and boredom of captivity also induced the killer whales he worked with to engage in stereotypical behaviors that could become obsessive to the point of injury. One such behavior was head-banging, in which an animal would repeatedly bang its head against the pool wall or floor. Hargrove in particular remembers Sakari, a young calf at SeaWorld Texas. "She would go down and hit her head on the bottom of the pool, over and over to the point where her jaw would be bloody and bruised," Hargrove says. Once, according to Hargrove, the damage was so bad that Sakari stopped eating for a few days because it was painful for her to open her jaw. "Once they got to the point where the jaw was bloody and badly bruised you would think they would stop," Hargrove notes. "But they wouldn't stop." Hargrove also recalls the tendency of some whales to spend their time picking at the paint coating the pool walls and floor. Another SeaWorld Texas orca, Unna, was obsessed with picking at the paint on the bottom of the show pool, according to Hargrove, and would go at it so hard her rostrum would get torn up. "Unna used to destroy her face. Sometimes it would get so bad she wasn't allowed in the front pool until her face healed," he says. "Then we would let her out and try to prevent it. Sometimes she would leave it but eventually her focus would always go back to it. And once her focus went back to it it was an obsession, and she would do it until she injured herself." Over time, Unna peeled up such large swathes of paint from the show pool floor that it became a problem for trainers during waterwork, who use the floor drains to locate themselves correctly in the pool for specific stunts. According to Hargrove, the darker patches left by Unna's peeling looked so much like the floor drains that he had a hard time being sure where he was (and leading trainers to joke that she was doing it on purpose to confuse them). It was a bad enough problem that the trainers lobbied for years to have the show pool repainted (in vain, says Hargrove, "they didn't want to spend the money"). But do wild whales exhibit this sort of idiosyncratic, repetitive, behavior? "Repetitive Stereotypes are by definition seen only in captive animals. I know of no such self-destructive repetitive behaviors being observed in wild whales (or any wild animals)," Naomi Rose, a marine mammal scientist with the Animal Welfare Institute who has studied wild whales, writes in an email. "While certain ‘odd' behaviors are sometimes seen in wild animals (I once saw an adolescent wild orca male tail slap probably about 50-100 times in succession -- clearly unusual), they are not randomly observed. In short, in the wild, there are some odd whales -- most are not odd. In captivity, there are many neurotic whales and only a few are not." To Hargrove, obsessive-compulsive behaviors dramatically illustrate how difficult it is to adapt killer whales to captivity, no matter what drugs or training strategies are used. "The whales are stimulated some of the time. They do have fun in sessions and are entertained," he concludes. "But what we could give them was not enough, and we couldn't stop them from doing the stereotypical boredom patterns that resulted in health issues." Editor's Note: Hargrove is set to testify Tuesday at a California State Assembly hearing on a proposed bill to ban orcas in entertainment. You can visit both the Animal Welfare Institute and the Dolphin Project to learn ways to support the bill.